I've been investing in Mintos.com peer to peer lending marketplace since the beginning of 2017, or it has been already 24 months or two years since I've been exposing my funds to this Latvian fintech platform. At the end of 2018, mintos.com took the second largest position (after stocks) in my portfolio with 23.3% of my funds invested on Mintos.com marketplace. A diversified portfolio helps. Never put all eggs in one basket, as they say. 23.3% seems to be a kind of save level to be exposed in peer to peer lending, but in fact, I would love to limit this number to 20% in 2019, meanwhile by increasing total amount lent via peer to peer lending. Despite being just second in size Mintos, have been the top earner in terms of dividend income (loan repayment) in 2018, in a passive income earning me EUR 591.14 or EUR 1.61 daily. Dividend income from the Baltic stocks earned me €386.56 or EUR 1.06 daily. Unfortunately, because of I keep investing both in EUR and GEL currencies and because of currency exchange rates, the total value for my investment if converted back to EUR currency at the end of 2018, equals just to EUR 3,861.06, which is a negative -3.2% value growth. Be cautious when investing in international currencies. 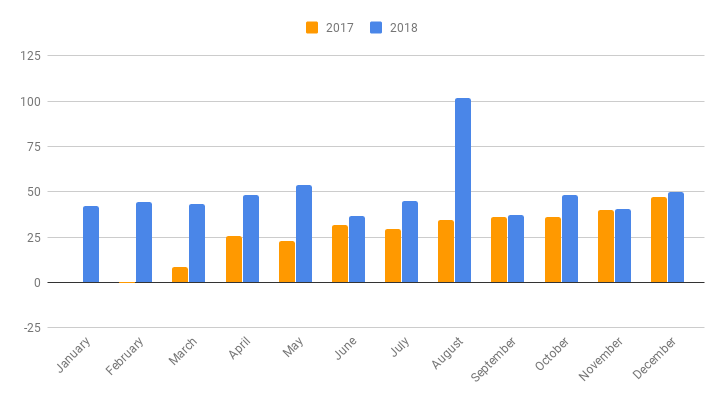 Mintos.com contributes regularly to my dividend income with little over than EUR 40/mo, and I'm looking to increase interest earned here to about EUR 50, during 2019. 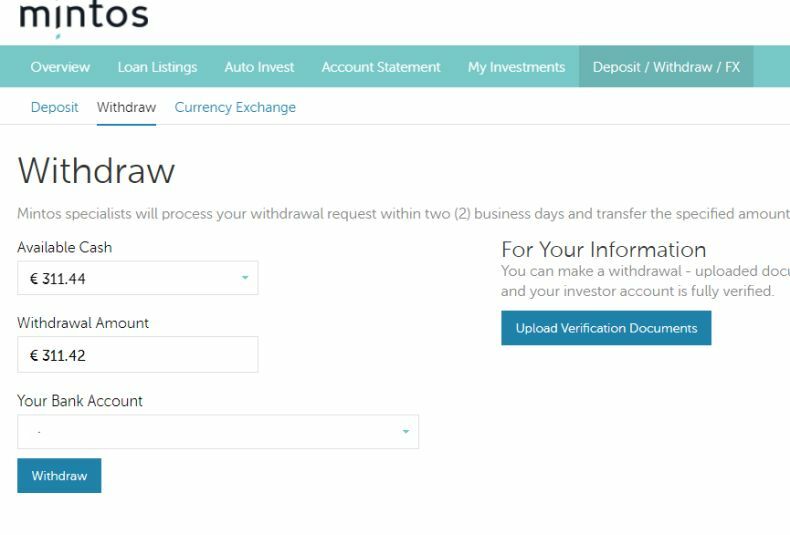 During 2018 I have withdrawn money from Mintos.com peer to peer marketplace several times, to finance new purchases on Nasdaq Baltics or NY stock exchanges I most times money arrived at the bank account in one-two working days. Now, from money earned on Mintos.com platform I should pay taxes, luckily the platform offers simple tax guidance for the citizens of Latvia, Germany, and other countries. Tax reports for private individuals - residents of Estonia, Germany, and Latvia are available. Tax reports for 2018 for Germany and Estonia will be available from January 11, 2019. For investors from other countries, a general tax report template is available. To receive your tax report, please select your country of residence and it will be sent to your email shortly. Due to various accounting standards applied by legal entities, there is no specific report for legal entities. Please consult with your accountant on how income generated through Mintos should be recognized and how taxes should be calculated. I requested my Tax Report, which was shortly emailed, and for 2018 seems I need to pay a tax from EUR 235.22 and GEL 1086.55 . According to the Latvian Tax system I might have to pay 23% income tax. Which would mean I've to pay in tax EUR 54 and GEL 250. As I'm not a tax advisor, I cannot comment much on here, for further questions and your situation please consult your tax advisor! Despite Auto Invest works like a charm, in 2018 I've disabled it and now I'm doing all investments manually, as I like to keep a hand on the pulse. I really like the way how Mintos operates, these past 24 months here have given me a lot of confidence to trust the platform, buyback guarantee works excellent, all due loans have been bought back with interest applied. During 2019 I plan to increase my investments in Mintos.com marketplace to about EUR 5,000 both in EUR and GEL currencies. Also, I'm looking on about EUR 500 - 600 income from this peer to peer platform in 2019. Still, I won't hide my doubts in the longer-term success of such business, mainly because of the following reason - investments in developing economies. Countries and regions where Mintos.com operates right now seems are experiencing growth. Or, let's say - we are in the bull market, but what will happen during the upcoming bear market? For me, EUR 5,000 is a maximum limit to invest here, at least in 2019. Remember your capital is at risk, never invest more you can afford to lose. If you are interested in peer to peer lending, and you are from EEA/EU or Switzerland, consider investments via mintos.com platform, and register for investor account here.